It’s been a while since I shared all of my current projects and since I recently cast on some new things, I figure it’s time to share what I have on the needles today. Sometime at the end of August or early September, I decided I needed to have a plain vanilla pair of socks on the needles. I have enough stripey yarn that I could probably have a pair of striped socks on the needles for at least a year or two! I pulled out a skein of Vesper self striping yarn in Venus in Furs. This is a colorway I traded with Jen (of the Piddleloop Sewing Team) for. I don’t know if my knitting changed or what, but for some reason my normal 64 stitch sock was way too big. Then, I went down to a US 0 made, but the fabric I was getting was a bit too tight and the sock (66 stitches) was too big. After a number of failed attempts at getting these socks going, around mid-September I finally re-started these with a stitch count that worked (60 stitches). 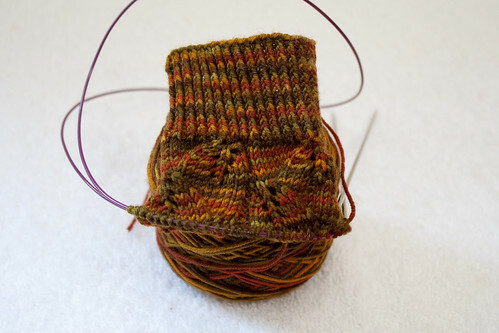 I’m past the heel and halfway through the leg on the first sock. Behind the sock, you’ll see one of my bags from Jen. I love the fabric and it’s just the right size for a sock project! I think I could have forced myself to work on things I had going, but last week Knitty released their Deep Fall issue and Brooklyn Tweed released the Fall 2011 collection. Two patterns jumped out at me as things I MUST KNIT NOW. The pattern from Knitty caught my eye was Ambroso. I had a skein of Cascade 220 Superwash on hand that I’d been trying to find a pattern that suited it. Yesterday I spent a lot of time working on the decreases on the top of the hand portion, but after working it as written twice and trying to adjust it twice, I’m just not happy with how it’s turning out. The decrease section on the outer part of the mitten tends to shift itself almost to the center of the backside of my hand. Personally, I’m not at all a fan of how this looks. In looking at the pictures on the pattern page, I do notice this issue. I guess I didn’t think much of it when I started knitting them. After some thought on what to do since I couldn’t straighten it out, I’ve deiced to make these into fingerless gloves instead! 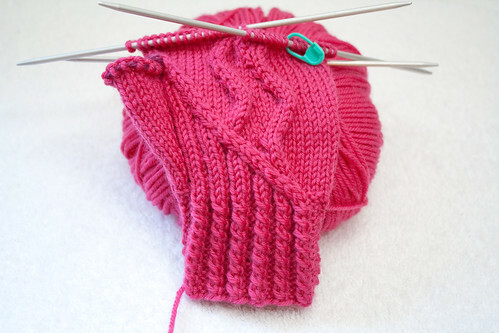 I’ll knit ribbing around the thumb and hand to match the cuff. The pattern from Brooklyn Tweed that caught my eye was Ashby. As the weather has turned a little cooler, I’ve found myself wanting something light that I could wear and easily take off. A non-lace shawl made from a warm fiber was just what I needed. I picked up some Ultra Alpaca and started it this past weekend. I like the construction of it. You knit the edge first, then pick up the stitches from the edge and knit the shawl from there. It avoids the problem of having 400+ stitches when you get to the bottom of the shawl! The color of the yarn is a little lighter in person then the photo shows. For a while now I’ve wanted to make a pair of Embossed Leaves socks. I also wanted to use up this very fall colored yarn I got from the Loopy Ewe Sock Club last year. The yarn is Alchemy Juniper in Autumn Ecstasy. I’ve not used this sock yarn before and at first I wasn’t fond of the colors, but it seems to have grown on me and has been demanding that I make it into some nice fall socks. 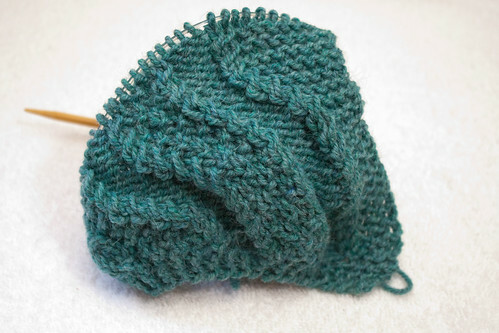 When I saw another pair of Embossed Leaves out of this very colorway, I knew I needed to finally knit this pattern. So far I’m enjoying both the yarn and the pattern. The yarn reminds me a bit of Fiesta Baby Boom. Looks kind of fluffy in the skein, yet isn’t as fluffy when you wind it at work with it, but makes a really nice fabric. Despite casting on three new projects, I can’t shake the urge to cast on more things! I’ve noticed some other folks feeling the same way. Maybe it’s just the time of year. The weather has started to cool for many of us. For many knitters and crocheters, we start to think of all the warm, wooly things to knit and wear during the cooler months. I’ve already got my eye on at least one pair of fingerless gloves, a scarf, a hat, and a few pairs of socks. I won’t even talk about all the things in my queue! Have you started any projects recently? Is anything calling to you to start right now? Any new patterns come out recently that you just can’t resist? 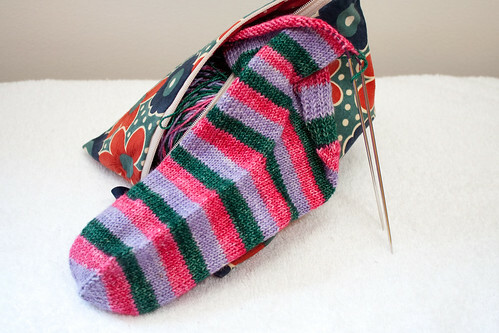 I can’t wait to start my stripey sock yarn socks!! And the embossed leaves socks look gorgeous!! Right now I am doing an owlie sleep sack for a friend of mine. As soon as it’s done, I’m casting on socks! Oh wow…I’m so digging on all that yarn. The colors! The knits! ❤ Total love! But I really have to say that all that autumn colored yarn on that embossed leaves sock is totally killer, but really,I should have it. I mean it. Save your sanity (and your energy) and hand it all over to ME! hahahahaha! lol No seriously, I love it. Those embossed leaves socks are going to be GORGEOUS! I’ll have to agree with the two ladies above me, the embossed leaves socks are gorgeous, but I’m biased when it comes to fall colors!